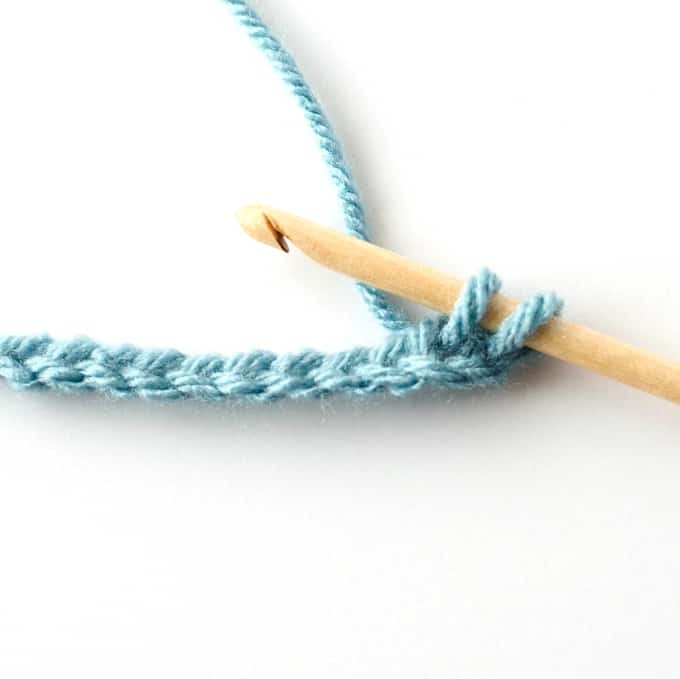 Single Crochet is both the easiest crochet stitch to learn and one of the most frequently used crochet stitches. 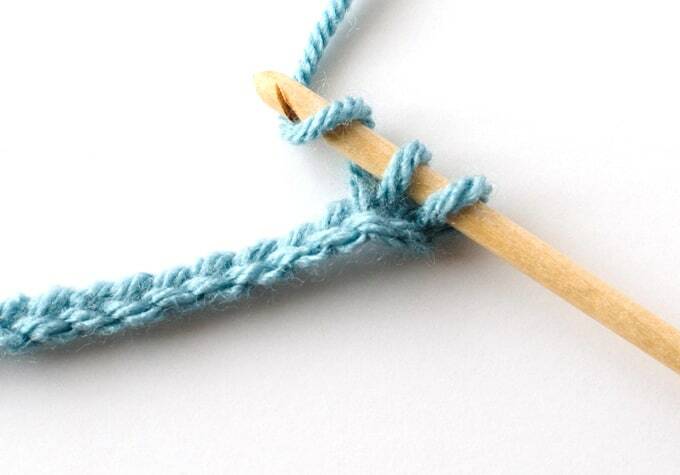 Once you learn this stitch, you’ll have the foundation for taller stitches. Single crochet is a favorite for amigurimi or soft toy makers because it makes a very dense fabric that is very durable. It is used by itself or in combination in almost every pattern. 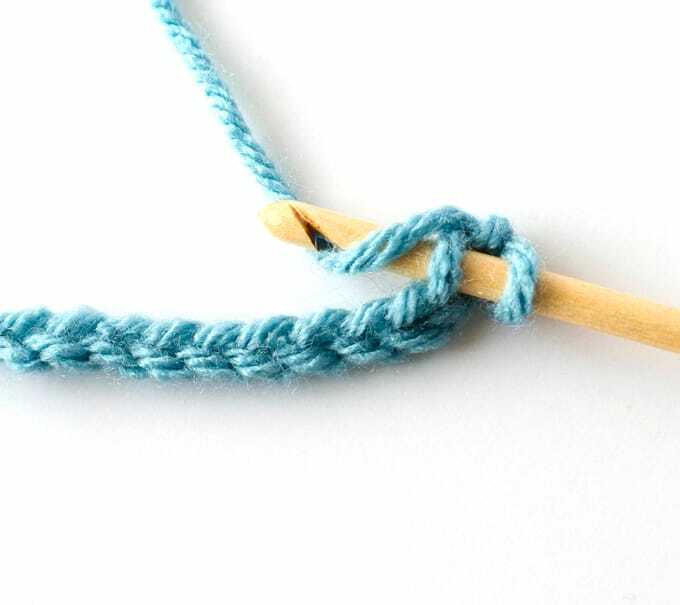 It is the perfect stitch to learn after you master the slip knot, chain and slip stitch. 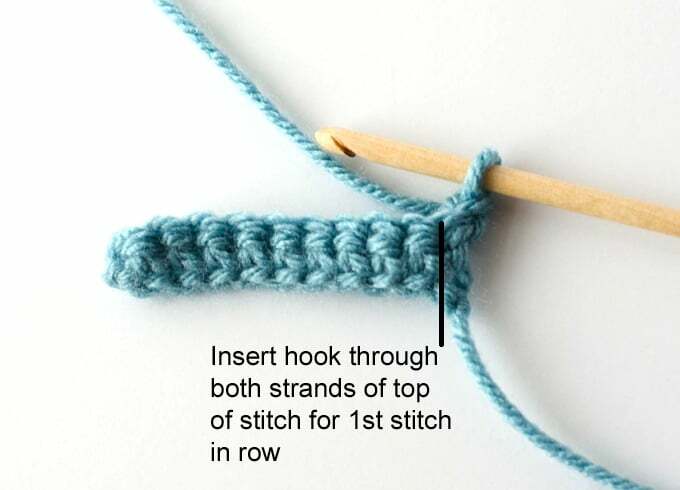 The abbreviation for single crochet is “sc”, which is how you will see it listed in a pattern. To get started, make a foundation chain. If you are following a pattern, the pattern will let you know the number of chains you need to make. Insert hook into the 2nd chain from the hook. You may insert the hook under 1 or 2 strands (and you can try both to see which you like best). I was taught to insert under 1 strand and so that is what I always do. It is easy and creates a nice edge at the start of your work. Use your left hand to hold the base of the chain. With your right hand, draw a loop over the hook and pull through the chain. You now how 2 loops on the hook. Yarn over again and this time, pull through the 2 loops that are on your hook. Ta da! 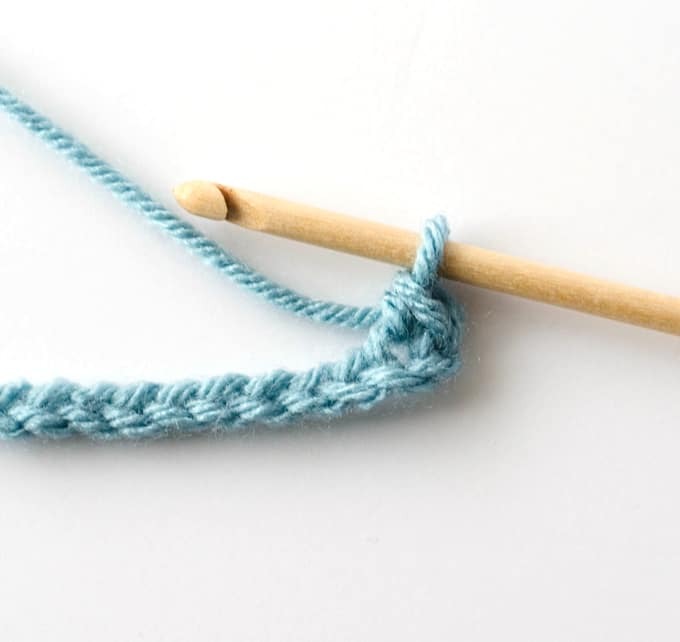 You made a single crochet! Continue along the foundation chain, working a single crochet into each chain, until you get to the end of the row. 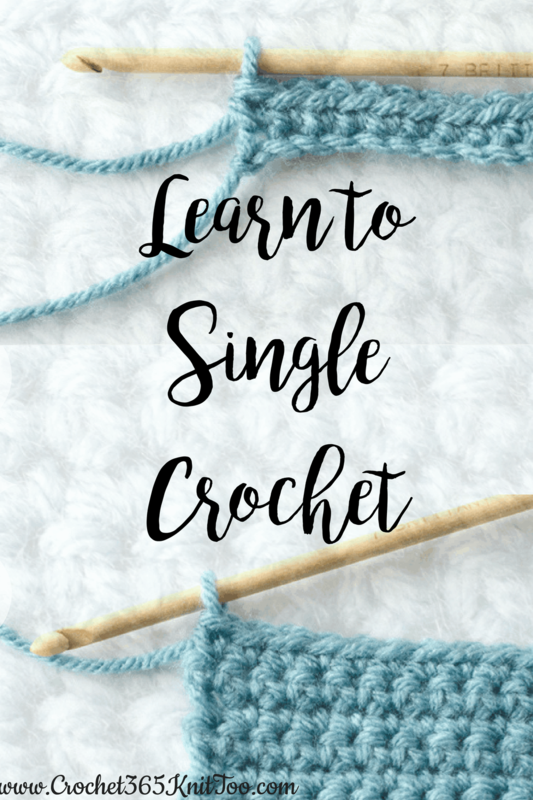 Need to work another row of single crochet? Here’s how you do it! 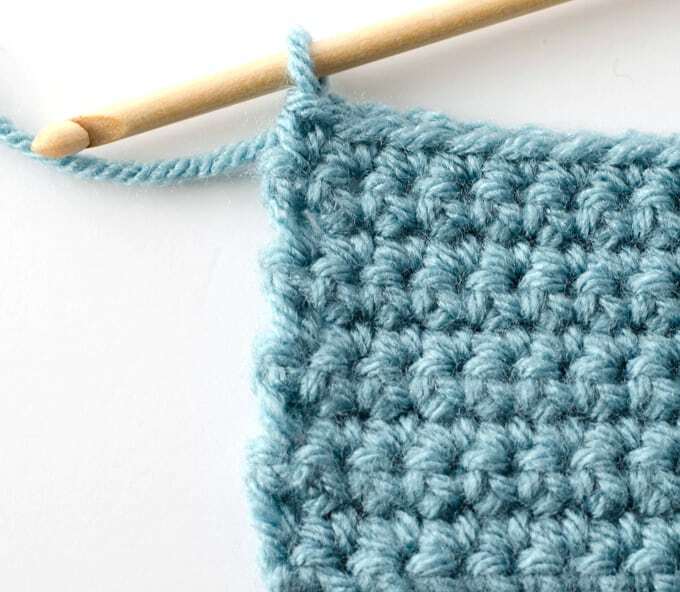 When working back and forth in crochet, you need to add some height to start the next row and determine where to work your first stitch. 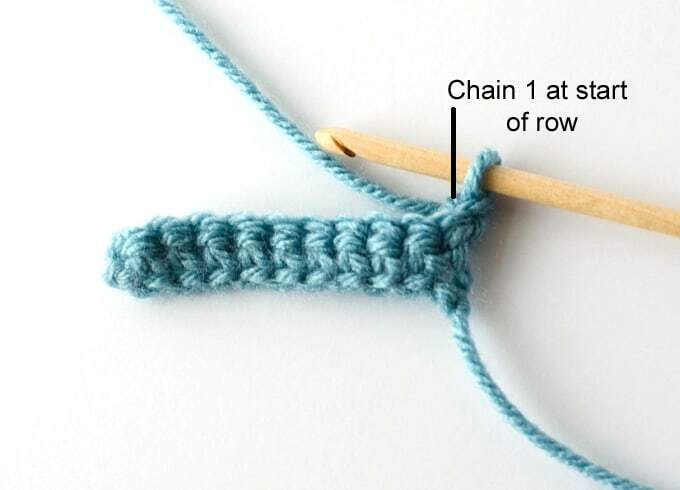 For single crochet, you chain 1 at the end of the row/beginning of the next and turn your work. 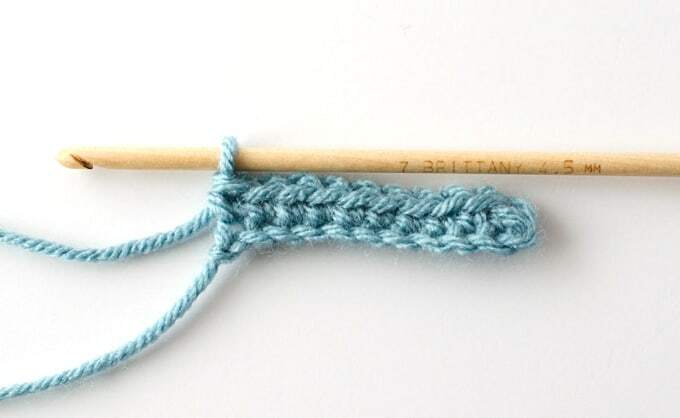 The chain 1 DOES NOT count as a single crochet, so you need to work your 1st sc of that row into the 1st stitch (which is the last stitch you worked in the previous row). For now, just know that the number of chains for height at the start of the row and whether or not the chains “count” as a stitch vary depending on what type of stitch you are doing. 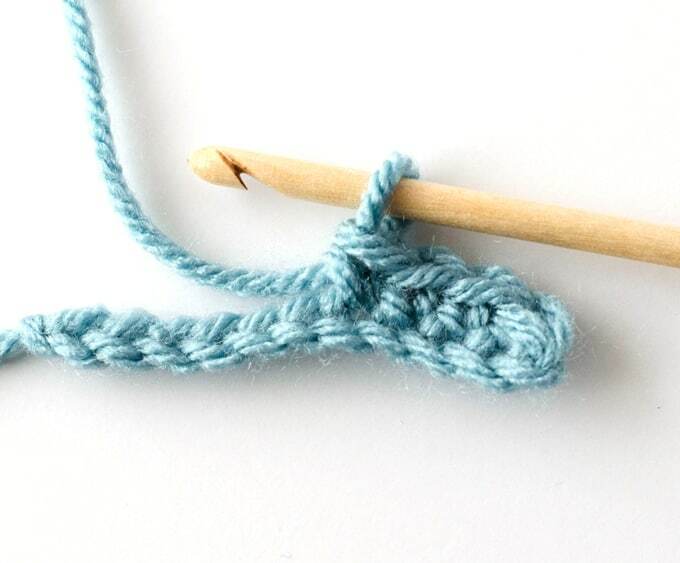 So again, in single crochet, you chain 1 and do NOT count that chain as a stitch for the next row. 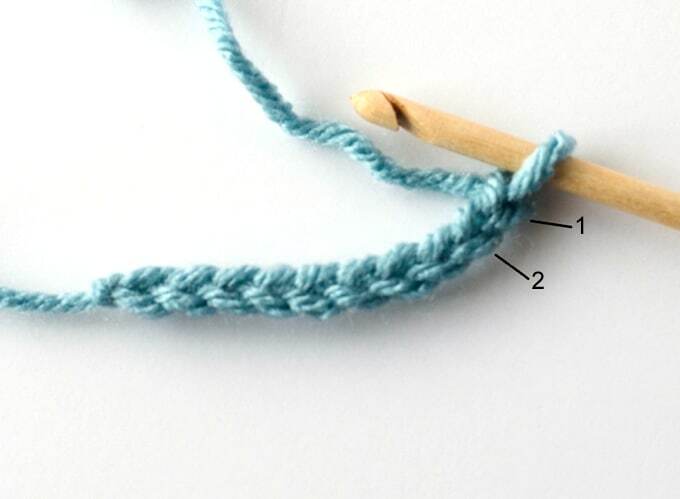 When you get to the end of the row, make sure to work a sc in the last stitch as shown above. Here is what several rows of single crochet look like, when worked back and forth. As you might notice from my “in my home” pictures, often when you are working the first few rows of crochet, your work might curl and bend a little. This perfectly normal. Your work will flatten out as you go along and add more stitches. 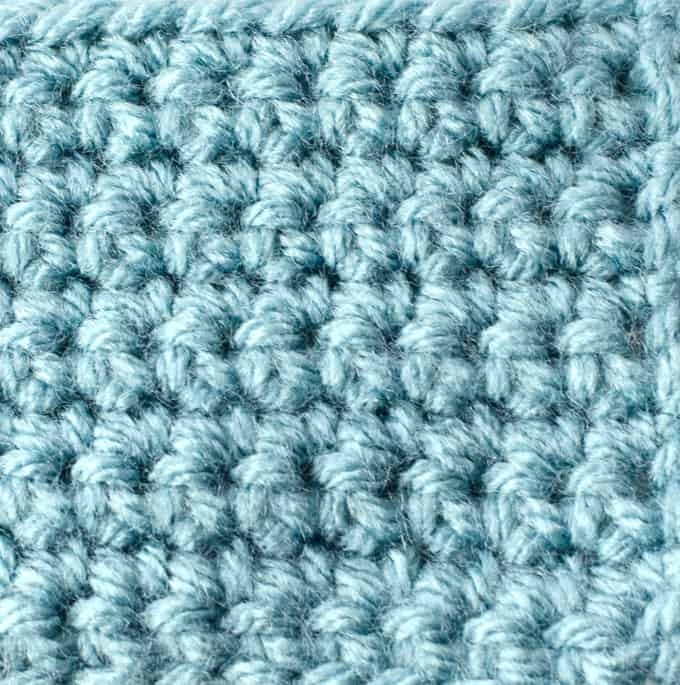 It is a good practice to count the single crochet stitches every row to make sure that you worked the correct number of stitches for that row. Also take a look at your work as you go along. If you are working a straight piece, your edges should look relatively straight like this photo. 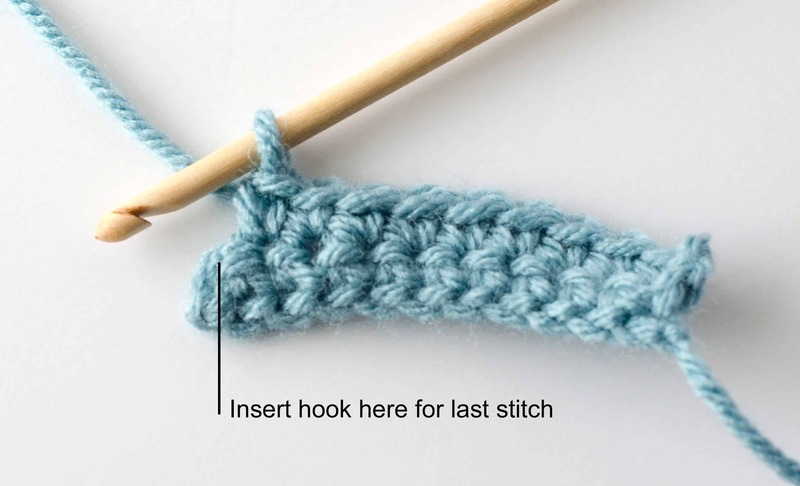 If your work starts going more to the right or left, you are likely working too many or too little stitches at the beginning or end of your row. 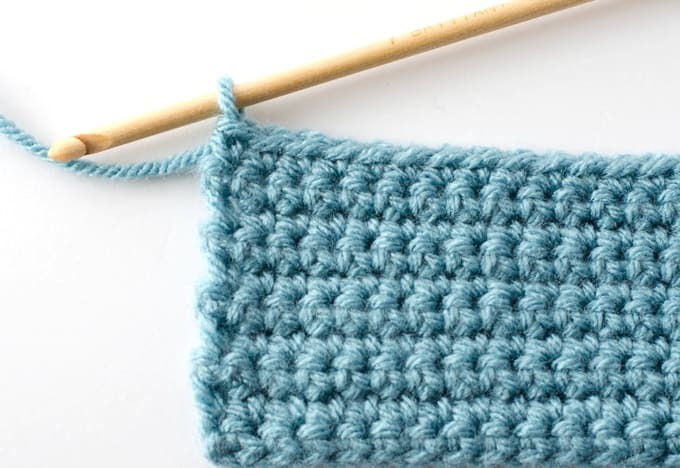 You will get better the more you practice and you will learn to recognize the look of single crochet and easily spot if you make a mistake. Speaking of mistakes…as my Grandma used to say, ‘rip, rip, rip’. Don’t be afraid to unravel your work to fix a mistake! It’s part of the learning process. Here’s a fun tidbit: If you ever hear crocheters or knitters refer to “frogging” or that they had to “frog” something, they mean they ripped out their work and re-worked all or a portion of the work. “Rip it, Rip it” sounds much like the sound a frog makes, doesn’t it?